"In the beginning was the Word." 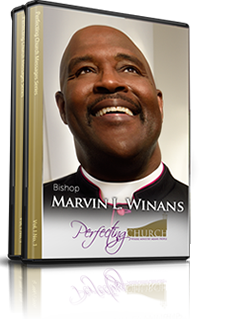 Perfecting Church was born out of a word or phrase given to a preacher/singer named Marvin L. Winans. That word was "they are coming to you." As young Minister Winans lay prostrate on the floor of Shalom Temple, the Holy Ghost spoke those prophetic words into his spirit. Mother Estella Boyd, through the leading of the Holy Spirit, laid hands on this young preacher and the power of God was so forceful that he lay slain under its influence! While lying there he saw a vision of people trickling toward him. It was then the Holy Ghost spoke into his spirit that phrase that should change the course of his life, "they are coming to you." Knowing that the suggestion of this epiphany was a call into the pastorate, he began to rebel. The more he said no, the more the sweet presence of the Lord would leave. Not willing to sacrifice the presence of God for the pleasures of this world, he surrendered to the will of the Father! As he began to say yes, the more the spirit of God inundated his soul. He looked again and saw a sea of people coming toward him. People of all races and creeds, and the Holy Spirit said once again, "they are coming." They began to come and Perfecting Church's first service was May 27, 1989 and has not ceased. The church started from a very humble manner with just eight members in the basement of Pastor Winans' home, then moving to the Michigan Inn for their first official service. After five months, services moved to the Urban Ministries Center for one month. Desperately in need of a house of worship, Pastor Roosevelt Williams and the assembly of the Greenfield Ave. Church of God opened their hearts and doors to this fledgling ministry; the people continued to come. Within seven months the church had outgrown its present location and was forced to move. Finding favor with God and man, Reverend Moore and the congregation of the People's United Methodist Church welcomed this young church in to their arms; the people continued to come. Just four short months later, the Lord blessed Perfecting Church to move into its own facility. The location was 13220 Greenfield in the city of Detroit. Pastor Winans once commented that he thought that the location on Greenfield would be large enough for at least four years; but in less then seven months the church was too small! Confronted with the dilemma of renovating or relocation, the Lord instructed him to add another service, this was the beginning of the 10:45 worship service. In less time than it took to fill the 3:00 service, the 10:45 a.m. service was standing room only; the people continued to come! After two years, Pastor Winans finally began the 8:00 a.m. service. Recognizing that each service had its own attendees, it created another problem; that problem was the fact that there were members that never worshiped together! How could this be one church if the people never fellowshipped together? The Lord instructed Pastor Winans to begin a First Sunday Service at Cody High School. This facility was large enough to host the entire Perfecting Church family at once. February 1994 began this new venture, this move proved to be two-fold. 1) It satisfied the need for the Church to worship as one. 2) It prepared the church for a larger edifice, which was soon to come. The First Sunday Service continued until Perfecting Church moved into its present location at 7616 East Nevada on the first Sunday of March 1996. In the very beginning Pastor Winans taught that "Ministry means People", and Perfecting Church has been an example of that teaching. With 30 ministries that touch the full spectrum of the human experience, from the ravages of drug abuse to the hopelessness of poverty; wherever there are people hurting, Perfecting Church works to find a solution. Perfecting Church began the Perfecting Community Development Corporation, which fosters community efforts such as the Marvin L. Winans Academy of Performing Arts, the Amelia Agnes Transitional Home for Women, the Jenesta McCraw Youth Activity Center, and the Perfecting Community Care Center. "Perfecting", as it is affectionately called, is in the midst of experiencing the favor of God as He proves Himself by continually adding to the ministry. Perfecting Church will soon relocate to 7 Mile & Woodward; the new campus (over 20 acres) will include a 4,300-seat sanctuary, parking structure, office building and market rate condominiums. Since its modest beginning (with 13 people at the first service in May 1989), Pastor Winans and the congregation pledged their commitment to God, and to its community. Years later, Perfecting Church strives to attain the purpose for which she is called, not for vainglory but that she might be ready to meet the needs of the people; ever mindful of the phrase spoken in that vision to Pastor Winans, "They are coming to you", making it a true cornerstone in the city of Detroit.